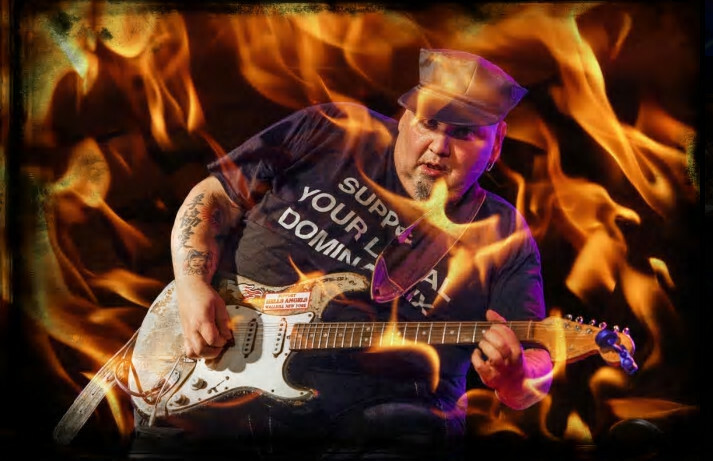 New York Blues Rock guitar legend Popa Chubby releases this 27 track, 2 CD set recorded live in France! The offering includes a vast selection of Chubby classics including Over The Rainbow and covers of some great Rolling Stones Standards. Larger than life blues figure Popa Chubby has a lot of reasons to feel lucky this year. 2014 marks the 25th anniversary of his emergence as a powerful force in the venerable New York blues scene with his very own band, and his own unique brand of hard hitting, face melting, blues rock n’ funky soul. And he’ll celebrate this major milestone the only way he knows how, with the release of a smokin’ hot studio album I’m Feelin’ Lucky – coming October 14 on Cleopatra Records – and a series of shows on the West Coast! Fans will also delight in hearing that Popa Chubby’s Feelin’ Lucky Tour hits the West Coast later this year with a slew of shows starting in Las Vegas at the Big Blues Bender held in the Riviera Hotel & Casino. For complete tour information, visit www.popachubby.com and get lucky with Popa Chubby! Sam has been teaching piano and guitar privately for 10 years. He is a professional pianist, guitarist, and composer. His unique percussive guitar style is admired by fans all over the world. He performs at venues and events all over the country as a full time traveler.